Blood pressure and colon cancer risk may be lowered with a vegetarian diet. The researchers analyzed seven clinical trials and 32 studies where participants consumed a vegetarian diet. The researchers measured differences in blood pressure associated with eating a vegetarian diet. The researchers found that adhering to a vegetarian diet was associated with reduced systolic blood pressure along with reduced diastolic blood pressure, compared to eating a plant and animal (omnivorous) diet. With colon cancer being the second leading cause of death in the U.S., finding effective ways to lowering the risk is imperative. A study found that colon cancer risk may be reduced with eating a vegetarian diet. The study included 77,659 participants with 380 colon cancer cases and 110 rectal cancer cases. 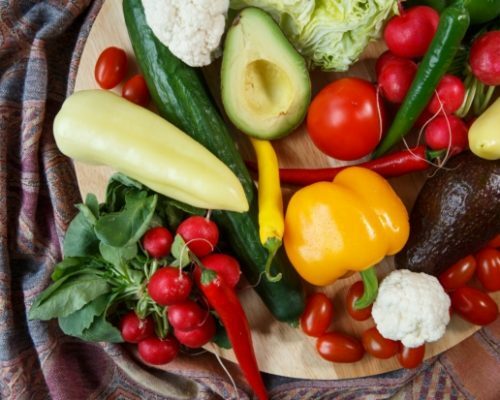 Vegetarians had a 22 percent reduced risk for all colorectal cancer, 19 percent reduced risk for colon cancer, and 29 percent reduced risk for rectal cancer. Vegans saw a 10 percent reduced risk of colorectal cancer, lacto-ovo vegetarians (eating milk and eggs) saw a 16 percent risk reduction, and pescovegetarians (eating fish) saw a 43 percent reduction. An alternative study found that adhering to a vegetarian diet may help reduce mortality rates. The study included 73,308 participants who were placed in one of five groups based on their questionnaire answers: non-vegetarian, semi-vegetarian, pesco-vegetarian (includes seafood), lacto-ovo-vegetarian (includes dairy and egg products), and vegan (excludes all animal products). The study counted 2,570 deaths throughout the study, and after adjusting for contributing factors, researchers found that all-cause mortality among vegetarians was lower, compared to those who were not vegetarians. Furthermore, the association between vegetarian diet and cardiovascular mortality reduction was stronger in men. There is evidence showing that vegetarians have a lower risk of obesity, type 2 diabetes, high blood pressure, cardiovascular disease, kidney disease, and some cancers. Unlike what many people believe, vegetarian diets can be nutritionally balanced with proper meal planning. If you are planning on becoming a vegetarian or already are, there are key nutrients your diet should include in order to receive the benefits from this style of eating. Protein: Protein is essential for normal growth and maintenance of body tissues. It is also vital for breast-feeding women. There are a variety of plant-protein food options that are suitable for vegetarians. These protein sources include whole grains, nuts and seeds, beans, tofu, and vegetables. These protein-rich foods contain both essential and non-essential amino acids. Plant sources of protein can be eaten throughout the day and will provide an individual with all of the essential amino acids needed for good health. For lacto-ovo and semi-vegetarians, dairy products and eggs are also good sources of protein. Omega-3 fatty acids: These may help maintain good health by reducing the risk of developing cardiovascular disease, reducing inflammation, and aiding with vision and cognitive function. Omega-3 fatty acids can be found in fish and eggs for semi-vegetarians. For stricter vegetarian diets, omega-3 fatty acids can be found in flaxseed, walnuts, canola oil, and soy. Iron: Iron is important for carrying oxygen through the body. A lack of iron can result in anemia. Iron that is found in animal sources is easier for the body to absorb. It is, therefore, difficult for strict vegetarians to obtain the required amount of iron for good health. Dark leafy greens are the best source of iron. Calcium: Calcium is needed for healthy bones and teeth, blood clotting, and for muscle and nerve function. For vegetarians that include dairy products in their diet, consuming healthy food that contains calcium is not usually a problem. For those that exclude dairy, dark leafy greens are a good source of calcium along with fortified juices and cereals. Zinc: Zinc is essential for good health as it is involved in many biochemical reactions in the body and helps the immune system to function properly. Beans, fortified cereals, soy, legumes, whole grains, and nuts are good sources of zinc. Vitamin B12: Vitamin B12 is needed for the formation of red blood cells and for proper nerve functioning. Deficiencies can result in irreversible nerve damage. It is important that vegetarians pay attention to this vitamin in order to maintain good health. Fortified foods are a source of vitamin B12 for vegans. Dairy products will provide vitamin B12 for other types of vegetarians. A vitamin B12 supplement may be beneficial if vitamin B12 cannot be obtained in adequate amounts from healthy food. These nutrients can be found in many non-meat options and it’s important that you eat a variety of different foods in order to obtain these essential nutrients.